38 mm brushed stainless steel case, transparent back, domed scratch-resistant sapphire crystal with anti-reflective treatment both sides, black dial, self-winding chronometer Omega 8500 movement with Co-Axial Escapement, date, and seconds, approximately 60 hours of power reserve, stainless steel bracelet. Water resistant to 100 m.
38 mm brushed stainless steel case, transparent back, domed scratch-resistant sapphire crystal with anti-reflective treatment both sides, silver dial, self-winding chronometer Omega 8500 movement with Co-Axial Escapement, date, and seconds, approximately 60 hours of power reserve, stainless steel bracelet. Water resistant to 100 m.
38 mm stainless steel case, transparent back, bezel with tone-in-tone Roman numerals, domed scratch-resistant sapphire crystal anti-reflective treatment on both sides, white opaline-silvery dial with a date window at 3 o'clock and a unique silk-like pattern inspired by several Constellation models produced in the 1960s, Caliber Omega 8500 self winding movement with co-axial escapement, chronometer, date, approximately 60 hours of power reserve, stainless steel bracelet. Water resistant to 10 bar (100 metres / 330 feet). 38 mm stainless steel case, transparent back, stainless steel bezel with engraved roman numerals, domed scratch-resistant sapphire crystal with anti-reflective treatment on both sides, Silver dial with an embossed lozenge pattern and a date window at 3 o’clock and engraved roman numerals, caliber 8500 self-winding movement with automatic winding in both directions to reduce winding time, approximately 60 hours of power reserve, stainless steel bracelet. Water resistant to 10 bar. 38 mm stainless steel case, transparent back, stainless steel bezel, domed scratch-resistant sapphire crystal with anti-reflective treatment on both sides, Blue dial with an embossed lozenge pattern and a date window at 3 o’clock and its engraved roman numerals, caliber 8500 self-winding movement with automatic winding in both directions to reduce winding time, approximately 60 hours of power reserve, stainless steel bracelet. Water resistant to 10 bar. 38 mm stainless steel case, transparent back, stainless steel bezel with engraved roman numerals, domed scratch-resistant sapphire crystal with anti-reflective treatment on both sides, grey dial with a date window at 3 o’clock, caliber 8500 self-winding movement, approximately 60 hours of power reserve, stainless steel bracelet. Water resistant to 10 bar . 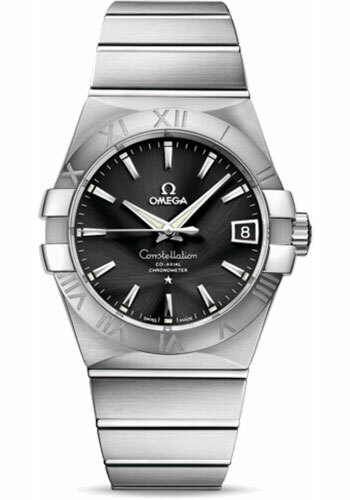 38 mm stainless steel case, transparent back, stainless steel bezel, domed scratch-resistant sapphire crystal anti-reflective treatment on both sides, grey dial with an embossed lozenge pattern and a date window at the 3 o’clock position, Caliber Omega 8500 self winding movement with co-axial escapement, chronometer, date, approximately 60 hours of power reserve, stainless steel bracelet. Water resistant to 10 bar (100 metres / 330 feet). 38 mm stainless steel case, transparent back, stainless steel bezel with engraved roman numerals, domed scratch-resistant sapphire crystal with anti-reflective treatment on both sides, bronze dial with a date window at 3 o’clock, caliber 8500 self-winding movement, approximately 60 hours of power reserve, stainless steel bracelet. Water resistant to 10 bar . 38 mm brushed stainless steel case, transparent back, domed scratch-resistant sapphire crystal with anti-reflective treatment both sides, black dial with diamond hour markers, self-winding chronometer Omega 8500 movement with Co-Axial Escapement, date, and seconds, approximately 60 hours of power reserve, stainless steel bracelet. Water resistant to 100 m.
38 mm brushed stainless steel case, transparent back, domed scratch-resistant sapphire crystal with anti-reflective treatment both sides, silver dial with diamond hour markers, self-winding chronometer Omega 8500 movement with Co-Axial Escapement, date, and seconds, approximately 60 hours of power reserve, stainless steel bracelet. Water resistant to 100 m.